This cake is so moist! I truly love to make it. It is so simple – no mixer required! And it is a small cake, so it doesn’t stay around the house forever. I hope you enjoy it! In a mixing bowl, mix together the persimmon pulp, eggs, butter, milk and vanilla. In a separate bowl, mix together the flour, 1/4 cup brown sugar, baking powder, baking soda, salt, cinnamon, nutmeg, ginger and candied ginger. 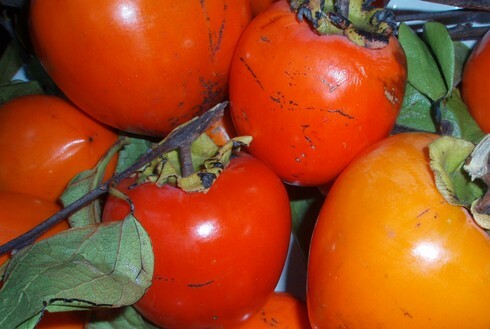 Add this mixture to the persimmon mixture and stir to combine. Add the chopped pecans and stir to mix well. Pour this mixture into the greased baking dish. Bake for 30-35 minutes, until the cake is firm but still springy on top. Allow to cool for about 15 minutes before serving. Just before serving, mix together the creme fraiche and the 1 T brown sugar. Garnish the cake with this mixture just before you serve it. This cake keeps well in the refrigerator for several days.